The ancestors came by canoe from the Holy Land of Yabisaba. We know it as Jerusalem. There were two boats, long and sturdy, hand carved from ancient trees. 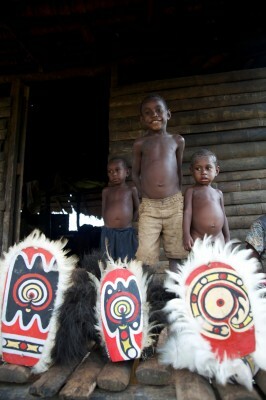 The red one carried the Segala clan and the yellow, the Paiya clan. The travelers spoke the language of Israel. They paddled in search of the far-off islands of Papua New Guinea, guided by the wisdom of an oracle called the Fire Source. The islands themselves, seven in all, had floated nearly 8,000 miles from the Middle East, destined to become home to the tribe those clans formed, God’s chosen people, the Gogodala. 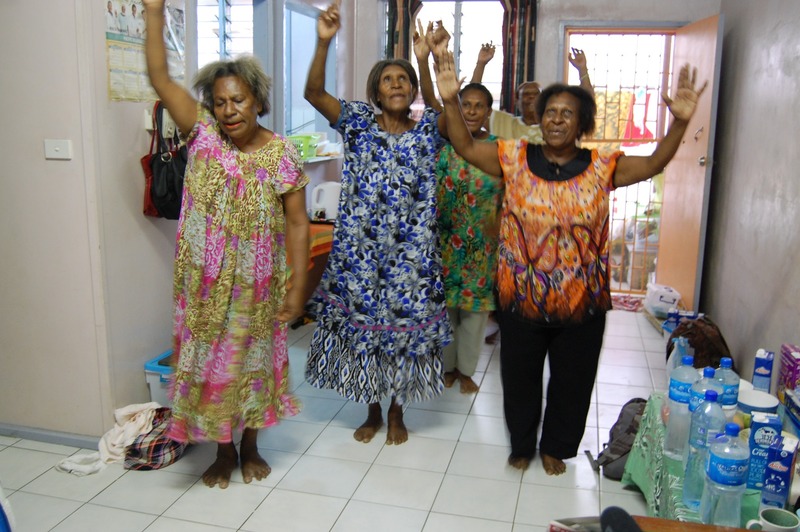 A Lost Tribe of Israel in the lush wilderness of a South Pacific Eden. This is the story the Gogodala tell of their origins and this is the story that animates their vision of the future. Now, they believe God is calling them home. Home to Israel. But they do not believe they can make it home alone. They yearn for scientific validation of the stories passed down through the generations. It is this desire, this urgent need, that drew them to Tudor Parfitt, an FIU Religious Studies professor who has been called “the British Indiana Jones.” For three decades, Parfitt has studied the global Israelite movement, becoming the world’s leading authority on the Lost Tribes. He has communed with mediums and disappeared into isolated villages. He is a searcher for cities of legend, and a discoverer of missing relics, none more precious than the artifact that sealed his lasting fame: Africa’s lost Ark of the Covenant. Parfitt’s research is, in many ways, a never-ending search for truth in science and myth, history and oracles, the sacred and the profane. That quest took the British Indiana Jones to Papua New Guinea for the third time in March 2013 to further unravel the mystery of the Gogodala’s evolving identity. FIU Magazine went with him. They crowded onto the airport tarmac in Port Moresby, Papua New Guinea’s seaside capital. Government officials, religious leaders, television news crews. It didn’t take long for Tudor Parfitt to realize that this trip would be different from his first two visits to the island. He brought a delegation with him – his wife Olivia, four FIU students, two FIU journalists and two rabbis from New York, Rabbi Gerald Sussman of Temple Emanu-El in Staten Island and his wife Rabbi Bonita Nathan Sussman of the Jewish non-profit Kulanu. But it wasn’t the VIP reception they received on March 10 that told him everything would be different this time, nor was it the way the delegation’s bags were whisked away or the way they were all waved through the airport without having to bother with customs or immigration checks. It was what waited for him outside the airport. A large crowd of Gogodala men, women and children had massed there, just to catch a glimpse of the famous professor as he was being ushered to an idling car. This was not quite the same Gogodala tribe he’d encountered during his last visit a decade earlier. Many carried Israeli flags and donned blue and white prayer shawls. They sang Hebrew hymns and called out to him, “Shalom! Shalom!” Gone were the traditional Gogodala grass skirts, bare breasts and conical hats of Parfitt’s memories. Women were covered up in long dresses. Men wore yarmulkes and T-shirts inscribed with Jeremiah 31:17: There is hope for your future. You children will return home. I, the Lord, have spoken. Port Moresby was merely a jumping off point. 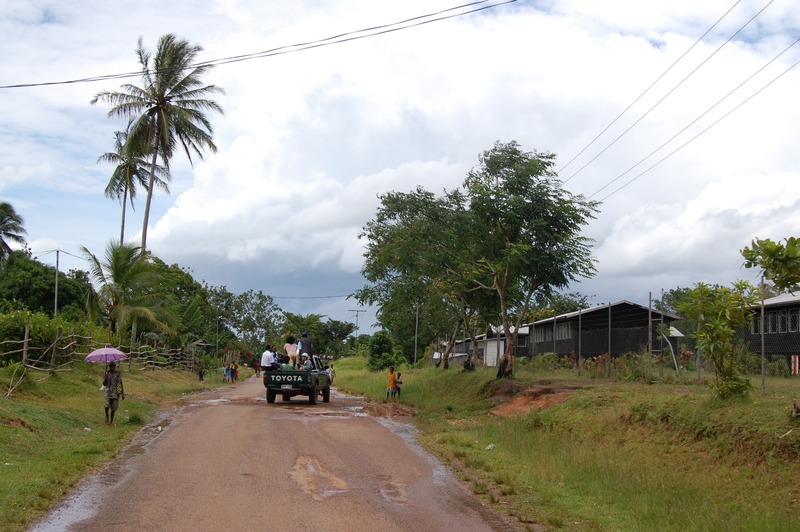 The delegation’s real destination was Balimo, a village so isolated that it can only be reached by plane or boat. Two days after the delegation’s arrival, Parfitt and his travel companions boarded a Papua National Air Defence cargo plane that took them to the island nation’s remote Western Province. Balimo, the ancestral home of the Gogodala, sits on a ridge of the Fly River floodplain. A lagoon provides the Gogodala’s bounty and its recreation, as well as the setting of its sacred story. There’s spotty electricity, and no televisions, no Internet and no phones except for the occasional cellular seen in the hands of a Gogodala visiting from the capital. The appearance of technology is recent, and the people remain largely separated from the rest of the world. The day of Parfitt’s arrival, hundreds of Gogodala sat waiting in the melting afternoon heat as the military plane touched down in a treeless field. Tribal leaders had declared the day a holiday. Schools and businesses in Balimo closed so everyone could attend the official welcome ceremony. Gogodala from other islands traveled for days to reach Balimo in time. Parfitt was prepared to be feted. On his last visit, a local couple had proudly introduced him to their first-born son. They’d named him Tudor. Now tribal elders, the mayor and a host of religious leaders were there to greet him. The flags of Papua New Guinea and Israel flapped in the sun. Women sang and children danced. They tossed flower petals along a grassy path leading to an open-air temple draped in flowers. Signs and symbols of Judaism were everywhere, the blue and white, the yarmulkes. The tribes people cried out “Shalom!” in sing-song voices. Each member of the FIU delegation was wreathed with a garland of colorful yarns as they approached the temple. Amid the swirl, Parfitt’s eyes fixed on a huge sign arching over the pathway. It read: WELCOME TO GOGODALA TRIBE DNA DECLARATION PROGRAM. A decade ago, Parfitt conducted DNA tests at the Gogodala’s request. They had wanted him to prove they are Jewish. The results were completely neutral, at the most, inconclusive. He’d expected the tribal elders to be angry. However, they seemed undeterred. Now, they were asking again, and this time, everyone was there to hear his answer. The path that led to this moment was a long one that began back in 1986. Parfitt was lecturing at a conference in South Africa when something he spotted in the audience captured his attention: a group of black Africans wearing yarmulkes. 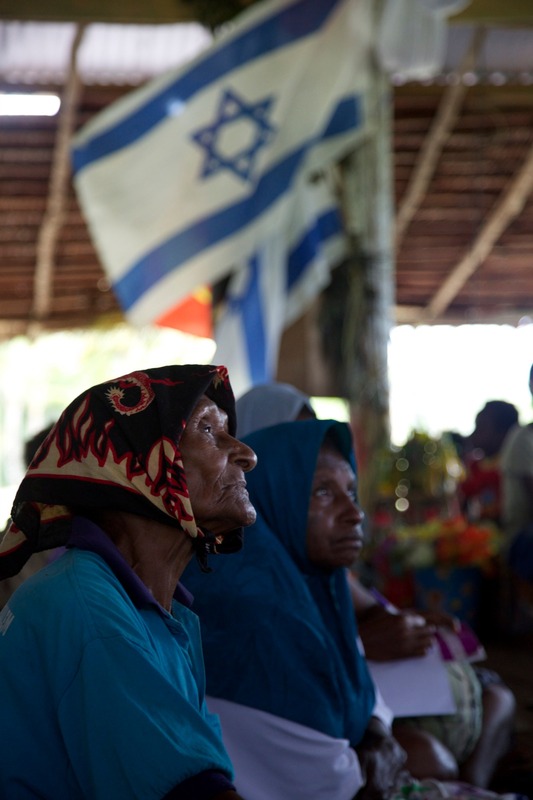 Later, they introduced themselves as the Lemba people of South Africa and Zimbabwe, and told him they were Jewish. The previous year, Parfitt had written a book about the famed Jews of Ethiopia, the Falashas, who had been granted aliyah or repatriation to Israel in 1977. Now the Lemba were claiming a similar Jewish heritage. Nonetheless, the ever-curious, Oxford-educated scholar accepted an invitation to visit the Lemba’s village. Once Parfitt was able to observe their customs, he started believing that there might just be some basis for their claims of Jewish ancestry. Following a hunch, he returned to Africa for six months to walk the Israel-to-Africa route the Lembas said they took in ancient times. He was searching for a lost ancient city the Lemba called Sena, the spot where the tribe had supposedly crossed from the Middle East to Africa. On his journey, he lost most contact with the world he’d left behind. The long walk left him bruised and exhausted. It was one of the happiest times of his life. Yet the journey was not over; it was merely on hold. This, as it turns out, is a pattern that would repeat itself throughout his career. The next day, Parfitt was led to the deserted city of Sena, where Jews may have fled Muslim oppression in 1000 A.D. 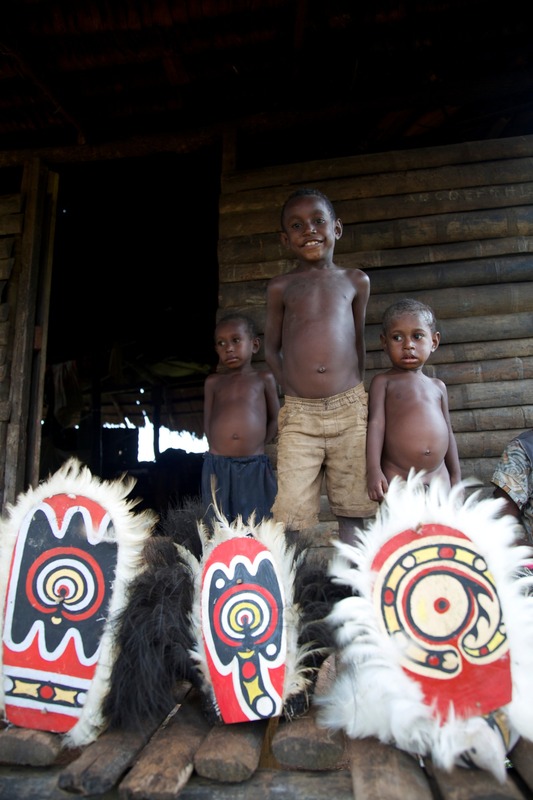 He discovered that the names of nearby tribes were identical to the clan names of the Lemba. Parfitt decided to compare the genetic profiles of the Lemba and tribes near Sena. Further genetic work carried out by Parfitt and geneticists established that Lemba priests carried what became known as the “Moses Gene,” which implied they were descendants of the ancient Jewish priestly caste, the Cohanim. The impossible outcome made international news. Yet Parfitt was only beginning. Soon he was searching for a holy object called the Ngoma. According to Lemba legend, it had been carried from the Middle East to Africa. It sounded to Parfitt like the Lost Ark of the Covenant, the chest that Christians and Jews believe held the stone tablets inscribed with the Ten Commandments. Parfitt’s remarkable search is documented his book, The Lost Ark of the Convenant, and in the History Channel documentary, Quest for the Lost Ark. The Ngoma had not been seen since 1947 when a German missionary found it in a cave on the banks of the Limpopo River, photographed it and placed it in a museum in in Bulawayo in what was then Rhodesia, now Zimbabwe. It then went missing. Years before, the spiritual head of the Lemba, Professor M.E.R. Mathivha, had asked Parfitt to find their ancestral Sena. He now asked Parfitt to find the lost Ark. He followed the clues. And he got nowhere. Once again, as in his search for Sena, he was at an impasse. And once again, it was a chance encounter that set him on the right path. This time in South Africa when a railway worker happened to sit on a nearby barstool. The man told Parfitt that he’d been tasked with transporting historic artifacts from Bulawayo to Harare, some 225 miles north, during Zimbabwe’s civil war. Perhaps the Ngoma had been moved? And there it was. Not on a mountain. Not in a cave. The sacred religious artifact of an ancient people sat uncatalogued, covered in dust and mouse droppings. Testing later dated the Ngoma to 1300 A.D., supporting Parfitt’s theory that it is one of the ancient replicas of the Ark of the Covenant made by people of the time. According to Lemba tradition, the original Ngoma had burst into flames and blown up. The one that he found is said to have been built on the old and it is possible that a small nugget of the original may be in the base. Scientists have been unable to test the artifact further because once again it disappeared from the Hrare museum. At any rate, Parfitt says, no one has been allowed to see it for several years, and rumors abound that President Robert Mugabe has stolen it. A hat full of hair introduced Parfitt to the Gogodala. A tribesman thrust it into his hands at a hotel lobby in Sydney, where he was giving a lecture at a university. Gogodala tribal leaders had read about Parfitt’s work with the Lemba. They wanted him to do the same for them and brought human hair samples to Australia for genetic testing. They hoped DNA tests would prove they were Jewish. 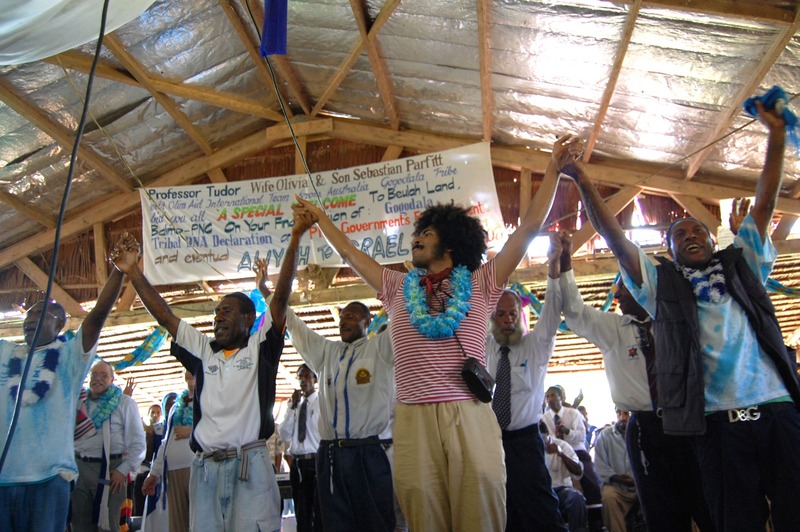 Parfitt was intrigued enough to accept an invitation to visit Papua New Guinea. On his second trip, he gathered samples for genetic testing. Even though those DNA tests would prove inconclusive, the Gogodala invested great hopes in Parfitt’s third trip to Papua New Guinea in March 2013. On his first day in Balimo, tribal leaders ushered him under the huge DNA Declaration sign, up a long hilly path to a seat at center stage before a large, excited crowd. They wanted to thank him. But they also wanted to somehow turn the uncertain questions about their genetics into a definitive statement about their ethnic identity. When Parfitt took the microphone, the crowd hushed and leaned in. Parfitt couldn’t tell them exactly what they wanted to hear. But he could tell them what he saw: a people, like others he has studied, like many more in remote places all around the world, finding their way to Judaism and Israel. Still, they waited for more. It was not an official sanctioning of Jewish identity. But, for the crowd, it was a moment of triumph. The men cheered. The children bounced up and down. The women wept. They were Israelites now. The professor told them so. The celebration sparked by Parfitt’s words lasted for days. Each member of the FIU team received a Gogodala name as a way of welcoming them to the tribe. Graduate student Sabrina Diz became Maewato, or fish. Undergraduate Keysel Pelaez was Waliya, or eagle. The Gogodala gave Parfitt the name Bogela, the man-god who is considered the ancestral father of the tribe. Parfitt was eager to see how the people of the tribe and the village itself had changed in 10 years. They remain hunter-gatherers with a barter-based economy and no obvious means of earning money. The pulp of the sago palm was still the staple of their diet. Within living memory, cannibalism was practiced by the tribes living around the lagoon. The Gogodala are a people in the midst of a profound identity shift. The influence of evangelic Christian missionaries is palpable, even as the Gogodala paint the Star of David on their doors. 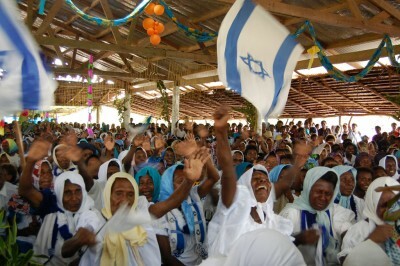 Some Gogodala identify strongly with the Judaizing movement; others do not. Still others are uncertain what any of it means. 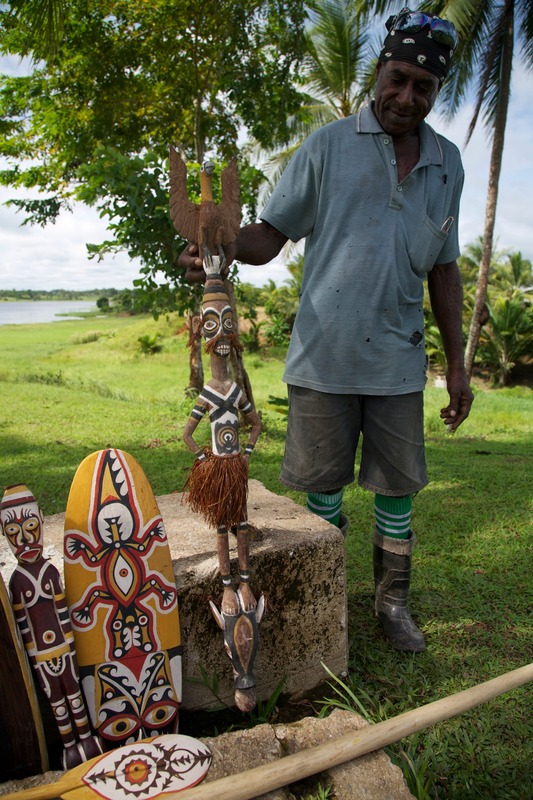 At the same time, the tribe is reclaiming its pre-Christian traditional culture of woodcarving, dance, ancestral deities and ceremonies, which had been discouraged by missionaries. For much of his visit, Parfitt was listening and chatting. Watch him in the field and you see that the real work of an Indiana Jones is the quiet labor of paying attention to details others miss. He talked with the high school principal and the wood carving artists, with women bouncing babies on their hips and members of the women’s Prayer Warriors group. He asked about their religious practices and beliefs, the stories they’d heard as children, their artwork and traditional culture, whether they want to go to Israel and why. He answered endless questions about genetic testing – what it can do and what it cannot. In candid conversations with Parfitt, some tribal leaders admitted they were unclear about the nature of Messianic Christianity – the belief in a second coming of Jeshua – that they have been practicing. Some seemed surprised that Messianism isn’t the religion of Israel. The tribal historians said the Gogodala observed Shabbat until just a few decades ago. Women, they say, were always separated from the rest of the family during their menstrual cycles. Men were always circumcised. Families adhered to kosher food preparation. They trace the Gogodala language to Hebrew. During one of his trips to Papua New Guinea, Parfitt set off on a quest. His visit had been consumed by the riddle of the Gogodala’s identity, but for Parfitt there is always another mystery to solve. He sought a holy relic – the fabled Gogodala Fire Source, the oracle that the tribespeople say radiated supernatural light to lead the ancestors to Balimo. Parfitt had learned of the Fire Source from a Gogodala spirit medium named Bibiato when she fell into possession during an ecstatic religious ceremony. She beckoned him to follow her. With the spirits speaking through her, she said she could lead him to the place where the ancient canoes and the oracle have remained hidden for centuries. “In her trance, she led us through reeds and water up to our necks,” Parfitt recalled. Swarms of mosquitos pierced his skin. But he found nothing.